It’s wedding season. While you may be jumping up and down in excitement for your friends who will be tying the knot, you might also be dreading finding something to wear. Never fear! Consider this your guide to plus size dresses wedding edition. 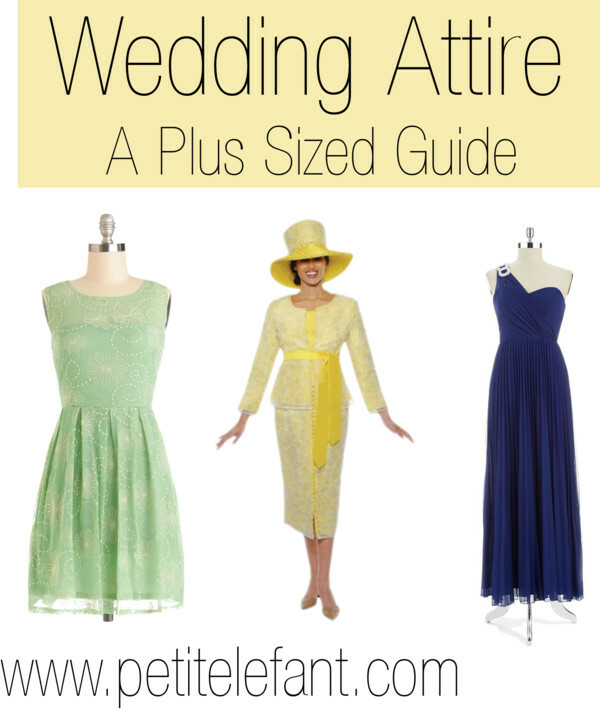 The first step in finding your perfect outfit is to know a little about the wedding. I’ve attended weddings that range from sit-down catered affairs to sitting on hay bales in a grove of trees to a picnic atmosphere were the guests were asked to bring a potluck dish. If you don’t know the couple well enough to know the details, and you can’t deduce them from the invitation, don’t be afraid to ask! The last thing you want is to be the person who shows up in a gauzy skirt and has to sit on itchy hay bales (ahem, speaking from experience). In general, a dress is appropriate. Any color except white is acceptable, for obvious reasons. However, black and anything that sparkles shouldn’t be worn during the day. Beyond that, the specifics are determined by the time of day and the formality/informality of the event. Casual weddings cover a wide range of possibilities, but a good rule of thumb is to wear a sundress or something similar. Casual does not mean jeans, shorts, or workout clothing. It’s still a wedding, so dress appropriately. You might look for something like the dress above. Plus size dresses for weddings, or in this case casual weddings, shouldn’t be too fussy with embellishments, but should look polished and comfortable. It’s always better to be a smidge over-dressed than under-dressed. Informal and Semi-formal weddings have the same dress standards. Weddings during the day call for a short dress (that simply means not floor length) or suit. Think floral patterns, polka dots, or pastels and you can’t go wrong. Consider the weather and location–opt for a bit of structure and breathable fabrics but avoid too much cleavage if you can! If the wedding takes place in the evening, you want to go for a cocktail dress. Something little and black is perfect, as long as it’s not full-length. A dress for this kind of wedding, if you’re curvy, should have a bit of structure and shape to it, and you definitely want to wear a saucy pair of heels–anything to elongate your body and add polish to the outfit. For a formal daytime wedding you should wear a dressy suit or short dress. Bonus, you can add a hat and gloves if you’d like, though it’s rare these days. 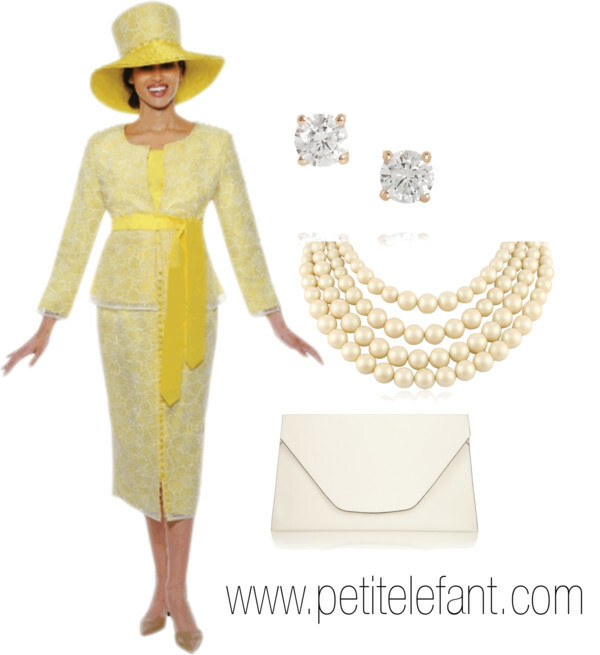 Envision guests at a royal wedding for your inspiration. A little more sparkle, a little more fuss, a little more sophistication than with informal or semi-formal daytime weddings. Think heels, pearls, lace to get you started. 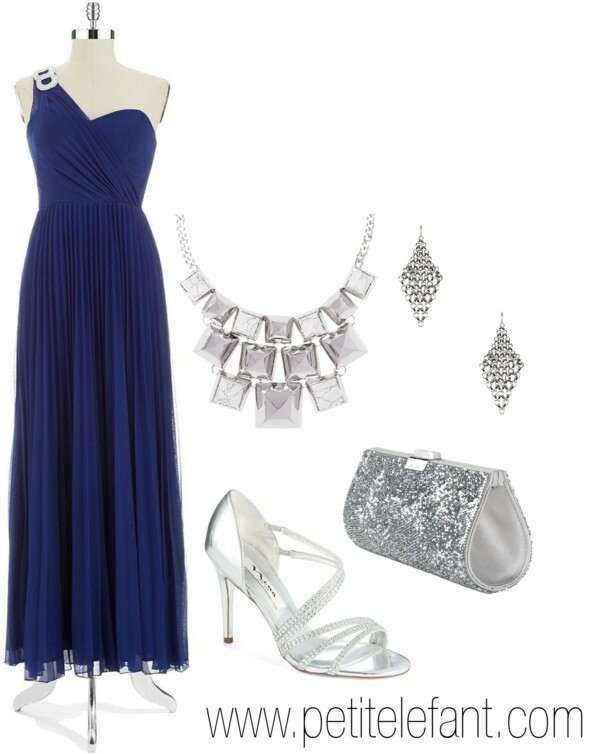 Pull out all the stops for an evening formal wedding. Long gowns, or dressy short dresses, shimmer lots of bling and wraps are all expected. Glamorous and elegant are the words you want to describe any plus size dresses for weddings in this category. Consider your best feature and play it up: toned arms with a one-shoulder dress, an hourglass figure with a cinched waist style, long legs with a side slit. I want to attend one of these in my life time. The ultra-conservative white tie wedding is completely over-the-top fancy. Wear diamonds, furs, and the glitzy-ist, swankiest gown you can find! There you have it: inspiration for plus size dresses for weddings. Don’t fear it. Go pretty and feminine, stick to 2 or 3 fabulous accessories, and play up your best assets. I love the two formals shown. Who sells them? Aren’t they great? The one shoulder blue gown is offered by Lord and Taylor. The beaded gown can be found at Dillards. Both are available online. Love the jewelry you show for the green dress. Do you know where it is sold? The necklace is from otteny.com and the earrings are from matchesfashion.com . Gorgeous! I was dreading shopping for a family member’s wedding in July. Now I’m excited! These are beautifully done. Aimee, so glad to hear that! How was the wedding? hi! may I ask where the casual dress, the bow ring, and the semi-formal dress came from? They’re adorable!! I’m sorry this is such a late response, but I can tell you where to find them! The casual dress is from DressBarn, the bow ring is by Kate Spade and Saks Fifth Avenue carries it, and the semi-formal daytime dress is from ModCloth. Happy shopping!